Chinatown in Bangkok can certainly be a bit hectic at times, and sometimes rather chaotic to be honest. The area is filled with delicious food vendors, shopping options, culture and a vibe that can be quite cool at times. Culturally stimulating and physically exhausting could be a proper description. And whether you’re there for business or pleasure, you need a quiet room sometimes to just relax and digest your impressions. Double Dogs Tea Room is a welcoming harbour from the rather hectic pace of life you’re part of when strolling up and down the streets and alleys. You don’t need to be a tea connoisseur to understand that Double Dogs take their tea serving seriously. I’m definitively not a connoisseur in the area, but I do know my cup of tea and have been using this air-conditioned shophouse along Yaowarat road – the main street of Chinatown – rather often when in the area. 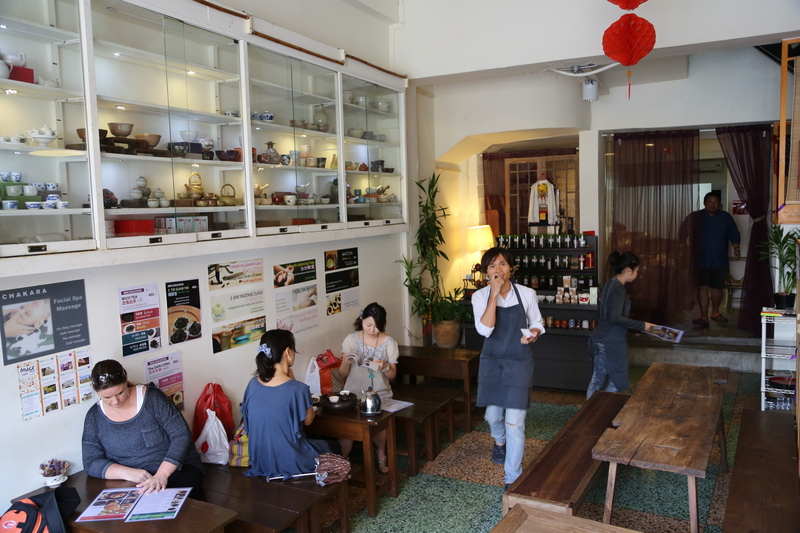 Double Dogs Tea Room serves a range of premium teas and Chinese cakes with all the pride and ceremony you would expect from a traditional tea room. 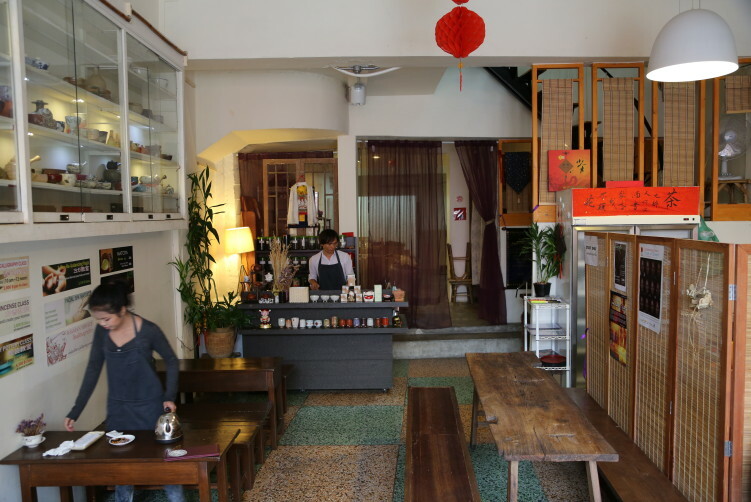 But the tea house isn’t an old one, it’s a rather new addition to the Chinatown scene, opening their doors early 2012. The tea is mostly from China, Taiwan, Sri Lanka and Japan. The country selection is further split into different types of tea, roughly categorized by the colour: green, red, blue, white, black and oolong (blue tea). The tea is, depending on the type, either served in miniature ceramic tea pots that hold enough water for one small cup, or in a larger bone china cup with the leaves still inside. They have both hot and iced tea. And tea, like wine and beer, or coffee, have their different identity. And as for wine, coffee or beer drinkers, tea drinkers have their own preferences. Blue tea, also called oolong tea, is partially oxidized and at different level for the selected variety. The flavor range from glassy green, floral, fruity, spicy and ripen fruit and from mild to strong level of oxidation. The Taiwanese, Fujian and Guangdong are two well-known examples. The Fujian’s tea has a light structure with a smoky fragrance. A green tea variation is for example Long Jing from Zhejiang in China. An example of white tea is Yin Zhen, while honey red tea is an example of a more mellow red tea with a yellow floral nose. It’s ample soft and with a smooth finish. For black tea you have for example Ripen Pu, an after-rain earthy nose kind of tea from Yunnan in China. But the variation is plentiful, so you won’t run out of new alternatives for a while if you start hanging out in the area. Japanese red fang tea and orange cake is also worth trying. Their cliental seems to attract more foreigner with a bigger buying power than the locals. Double Dogs isn’t expensive in western terms, but their prices are high enough to rule out the average Thai worker as a visitor unless they come 3 or 4 for sharing a pot. 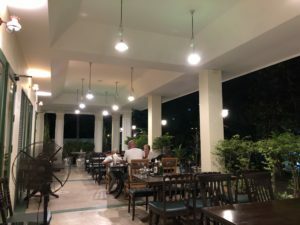 The decor is fairly simple, but it’s clean and the service is good. Not to forget that the menu is informative and easy to read, with separate sections on different tea types and regions. And of course you can buy the tea with you home and also pots and cups and whatever you need to make a proper cup of tea. My honest opinion is that they deserve their customers, but that the prices could be a bit lower. I tend to prefer places and vendors where both the average local guys and visitors to the area can show up to have their well earned cup of tea. Double Dogs has a nice relaxing ambience I really like. How to get there: Take the MRT (Metro) to Hua Lamphong and walk (12-15 min) from there or take a taxi. An alternative is to take the BTS to Saphan Taksin and then the boat on the Chao Praya river from there. Then you have a 10 minutes walk to Yaowarat Road, but be aware that the boats doesn’t run as late as the MRT. You find it on your left of Yaowarat road. Double Dogs Tea Room is a welcoming harbour from the rather hectic pace of life you're part of when strolling up and down the streets and alleys. You don't need to be s tea connoisseur to understand that Double Dogs take their teas seriously.